Scotland's most famous island is large and varied enough for many weeks of wonderful walking. From challenging ascents of the jagged Cuillin mountains to gentler rambles along dramatic coastlines, Skye has walking to suit all tastes. This 7 day self guided holiday provides an excellent introduction to the delights of this amazing island. This self guided holiday lets you explore the island at your leisure. We have selected what we regard as some of the finest walking routes on Skye and incorporated these into a tremendous week long itinerary. The routes we have chosen are not mountain hikes - you don't need to be a mountaineer to come on our holidays! - but some of the routes do take you into the heart of the Cuillin at low level, giving you a flavour of this magnificent range without the effort of climbing the peaks. We also include detailed information on many other walks on the island, allowing you to amend the itinerary if you see other routes that you prefer. Our comprehensive information pack contains everything you need for a memorable week. As well as details of the magnificent walking Skye has to offer, we also tell you the best places to eat, the most interesting historical sites, fascinating places to visit...and how to have a wonderful day even if the weather is bad! Base: Various locations available on the Isle of Skye staying at comfortable guest houses / B&Bs. ​Price: From £527 per person, based on two people sharing a twin / double room. Below we have added a suggested itinerary for this holiday. This would make for a fantastic 7 day tour of Skye. However, as part of your self guided package you will also receive comprehensive information on other walks on the island, plus ideas for alternative outdoors activities and things to do if you fancy a day off from walking, or if the weather isn't great. Treat the itinerary as a starting point, and amend it as you wish! Day 1. Travel to Skye. Day 2. Quirang. There really is nowhere in Britain quite like the Quirang. These remarkable rock formations in the north of Skye provide spectacular walking, and are almost better on a misty day, where the huge cliffs and stone pillars loom out of the cloud like fossilised giants! Day 3. Raasay. A day trip to the lovely island of Raasay, home to the wonderful Gaelic poet Sorley Maclean. This walk is full of variety, with great history and plenty of opportunity for wildlife watching. Day 4. Oronsay. A bonus island today! Oronsay is a small tidal island in a spectacular location, near the head of Loch Bracadale. Making sure you don't get cut off by the tide, you will explore its beautiful coastline and climb its small peak for fabulous views out over this huge sea loch. Sea eagles, otters and basking sharks abound in this area - so the wildlife watching should be excellent too. Day 5. Loch Coruisk. 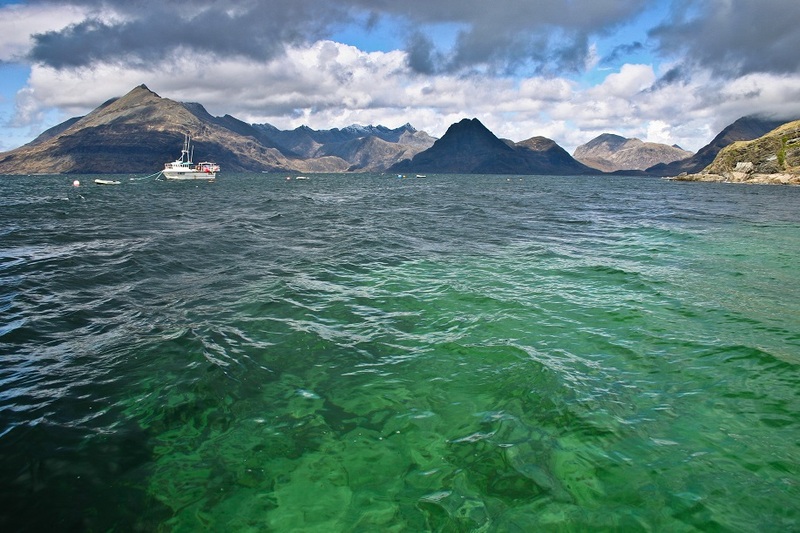 This will be a day to remember - a boat trip from the small crofting township of Elgol will take us across the head of Loch Scavaig to the remote and beautiful Loch Coruisk, nestling in the heart of the Skye Cuilllin mountains. This is wild, spectacular and uninhabited country. Spend the day beneath the rocky peaks, walking right round this beautiful freshwater loch, before catching the boat back to Elgol - looking out for basking sharks en route. Day 6. Boreraig & Suisinish. The final day takes you to the deserted townships of Boreraig and Suisnish in south west Skye. Beautiful and atmospheric, this walk will take you through gentle woodland, across lonely moorland and along spectacular coastal scenery, and will offer dramatic views across Loch Slappin to the mighty peak of Blaven. Skye has some excellent country houses and hotels - if preferred, accommodation can be arranged in these for an additional cost. The exact surcharge will vary depending on the rates charged by the hotel (some are more expensive than others). This holiday is graded Moderate. The routes vary in length, with the longest being the Boreraig & Suisinish walk at just under 10 miles. Like most Hebridean islands, the terrain on Skye can be quite rough, with wet boggy conditions or rough, rocky ground common. However, as it is a popular destination for walkers, there are more paths and tracks here than on many other islands, which makes both the walking and route finding easier. Despite this, you must still be able to navigate and use maps and compass effectively, especially if intending to walk any of the higher routes, where it is not uncommon to find oneself walking in cloud with low visibility. We recommend that you have experience walking in upland parts of Britain or Europe before coming on this holiday. What's Included: 6 nights accommodation, with full Scottish breakfast. A full set of Ordnance Survey 1:50,000 maps for Skye. Two walking guide books. Detailed holiday pack including all the information you need for a memorable stay in the Hebrides. The pack includes recommendations for walks we think you will particularly enjoy, advice about the most interesting places to visit, the best cafes and restaurants, alternative activities for bad weather days - and lots of tips and advice to help you get the most from your holiday. What's Not Included: Travel to and from Skye and whilst on the island. Packed lunches. Evening meals - we tell you the best places to eat out on Skye.Travel insurance. How do I get to Skye? Skye is best reached by car. There are two main routes from central Scotland. One goes up the A9 from Perth to Inverness then takes the A82 along the Great Glen before turning off at Invermoriston onto the A87 / A887 which will take you to Kyle of Lochalsh. The alternative route from Glasgow or Edinburgh is to take the motorway to Stirling and then turn off onto the A82 / A84 which takes you all the way to Fort William. From here you continue up the Great Glen towards Inverness before turning off at Invergarry onto the A87 which will take you to Kyle of Lochalsh. Once you get to Kyle of Lochalsh a spectacular road bridge will take you "Over the Sea to Skye!". An alternative approach is to take the train along the spectacular rail line running from Inverness to Kyle of Lochalsh, from where car hire is available. Can I book extra days? Yes! All our holidays can be amended to incorporate more or fewer days than the standard itinerary. Additional days are charged at £50 per person. What equipment do I need? Your equipment needs to be capable of coping with the very variable weather we get on Skye. It is quite possible to get driving rain, fog, then glorious sunshine all on the same day. It is also possible to get sunburnt in March and to have snow showers in May, so be prepared! We strongly recommend walking boots rather than shoes as the terrain on the islands tends to be rough, wet and uneven. Walking poles are optional but can be useful. A list of suggested equipment can be found by clicking here. When is the best time to visit? May and June are traditionally regarded as the best months for visiting the Hebrides, but any time of year can be good. April and September / October can be particularly good: there are fewer tourists around, the sun is lower in the sky so colours are more vivid - and midges usually aren't a problem! Are the midges bad on Skye? Midges are the tiny biting flies that can make a visit to Highland Scotland memorable for all the wrong reasons! In the summer months (late May - early September) they can be a problem on Skye. However, as it is an island, on still days it is almost always possible to escape them by choosing a coastal walk, where the light sea breezes is generally enough to prevent them flying.